First, think back over the past ten years, and look around your home or office and see how many new products you currently have that, in all probability, weren’t there in the 80’s or 90’s; it may just surprise you. In the past year or so, our agency has seen quite a jump in newly written Product Liability Insurance Policies. It seems that when I believe that every product one could possibly think of has already been produced, we receive more inquiries about insurance from new product companies, and some of these products are truly ingenious. The wide range of products include such items as dietary products, health products, food products, beauty and cosmetic products, sporting goods products, industrial products, medical devices, and clothing products which are among the thousands of different products that are sold across the country each and every day. With all the advances with the internet today, launching a new product has never been easier or affordable as it is today, which is probably why we are seeing the volume of new products launched now. If your company is considering launching a new product, your very first course of action should be to have Product Liability Insurance Coverage. When going over Product Liability Insurance with clients, it seems like we almost always get the same response: they consider their product so safe that they could never imagine a scenario where their product could hurt someone, thus causing a lawsuit, and nothing could be further from the truth. Regardless of what stage of the product cycle your company is involved with, when a customer is convinced that the product they purchased caused them harm in some way, they will target every entity that is even remotely aligned with this product and it could end up costing your company not only a costly claim as well as time consuming, and, in most cases, a very expensive lawsuit. This particular type of legal concept is better known as “stream of commerce” that governs product liability in most states. This means that any business that has any type of involvement in placing a product into the commercial stream could be held liable for a defect, thus exposing the business to the risk of paying damages for the defect. If the consumer were to have their claim be successful, they could be awarded punitive and compensatory damages, their attorney costs, and any medical expenses they incurred. Production/Manufacturing Flaws: With these types of claims, they usually involve a product that is deemed defective as a result of the company’s production process, which, in turn, makes the product unsafe. Defective Warnings/Instructions: When you last purchased a product, and it really doesn’t matter what that product was, did you happen to read the warnings that the manufacturer has placed on the product, and then your common sense kicked in and said, “Why do we need that kind of warning? It should just be understood.” The reason we have these warnings is from the legal risks that could happen from the consumer who purchased the product. With these types of claims being filed more often these days, you are seeing more companies putting much more detailed warnings on their products. Design Defects: When discussing this type of claim, it usually refers to how the product was designed in the first place. A good example of these types of claims would be those of a car manufacturer. We understand that most companies will do as much as possible regarding their products, taking all appropriate precautions, but, as we all know, things do happen–a customer could be harmed by your product, and your business could be held liable, which just reinforces the need for Product Liability Insurance Coverage. 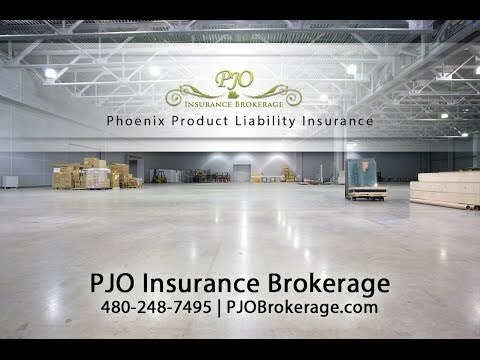 With Product Liability Insurance Coverage in Phoenix, insurance carriers have a duty to defend your company in the event of a covered claim, cover the costs to investigate the claim, and pay out any settlement or judgment that be made against your company up to the limits of the insured’s policy. In determining premium for these types of policies, there are no standard rates, mainly due to the fact that products are manufactured in so many different forms. As one expects, the lower risk products will carry a lower premium, and the products that pose a more serious risk to the consumer will carry a much higher premium. If your company is developing a product, distributing a product, or selling a product, PJO Insurance Brokerage has numerous insurance carriers to suit your product liability needs. We look forward to hearing from you. Call us today!